Charbroilers Provide Convenient Indoor Cooking Solutions For Grilling And Broiling Foods In Professional Food Service Environments. 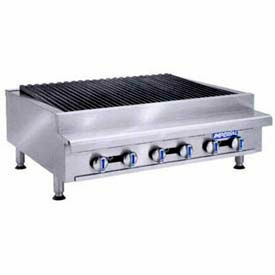 Charbroilers are made of stainless steel, cast iron and other high quality materials that provide even heat distribution for long lasting durability. Heating options include Radiant/Lava Rock, Charbroiler, Chicken Charbroiler and Countertop Charbroiler. Charbroilers use natural or liquid propane gas. Available BTUs range between 17,000 and 300,000. Dimensions vary per model.